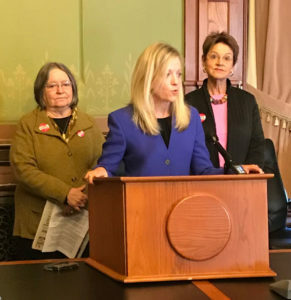 Senator Janet Petersen speaks as former Planned Parenthood leader Jill June and former Lt. Gov. Sally Pederson watch. Republican Governor Kim Reynolds has said at her last two debates with Democratic rival Fred Hubbell that she’d support letting Iowa women to buy birth control without a prescription. Democrats held a news conference at the statehouse to question the timing. Senate Democratic Leader Janet Petersen says a bill Democrats sponsored in 2016 to do just that was rejected by Republicans in the statehouse and Reynolds did not lobby for it. Petersen accuses Reynolds of “hypocrisy” after she signed legislation that has resulted in a 73 percent decrease in state-funded family planning services, including prescriptions for oral contraceptives, to low-income women on Medicaid. Petersen made her comments this morning during a statehouse news conference. A spokesman for Reynolds’ campaign referred reporters to comments Reynolds made to The Des Moines Register on this topic. 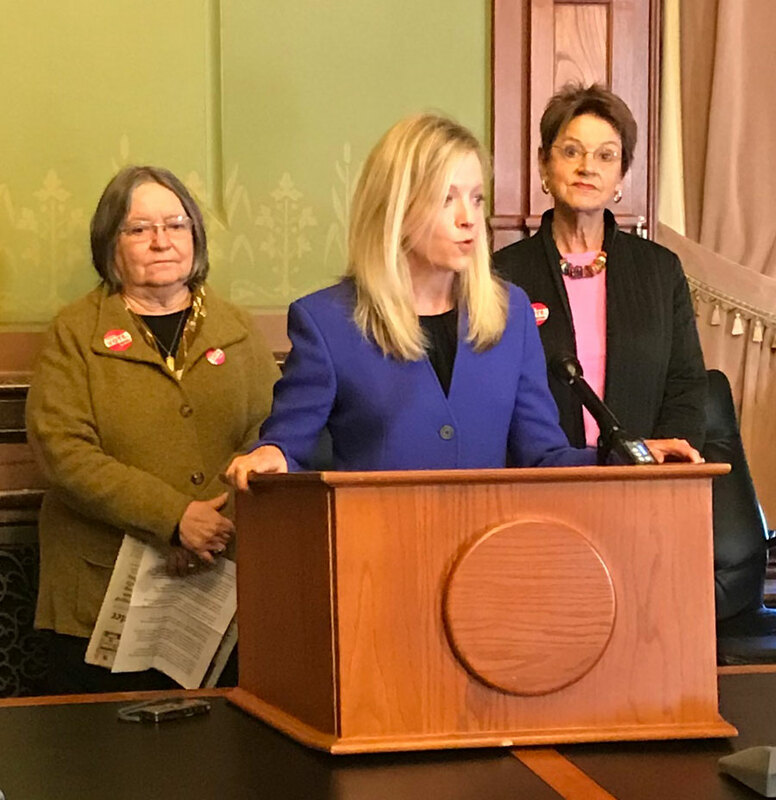 Reynold told the paper that non-prescription sales of “the pill” would help provide Iowa women, especially those in rural areas, greater access to contraceptives and would help reduce unintended pregnancies and abortions. Reynolds indicated she envisions still requiring a pharmacist to keep contraceptives behind the counter and dispense the medication on request rather than making it available for sale on the pharmacy shelves. Women in Canada and most of Europe can buy contraceptive patches and “the pill” without a prescription. In 2012, the American College of Obstetricians and Gynecologists issued a statement in support of the policy.